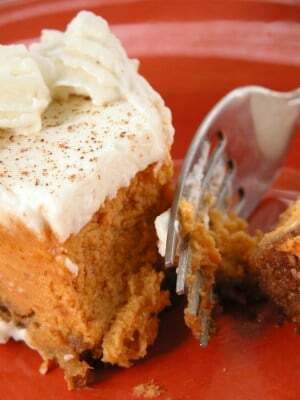 Home » Copycat Restaurant Recipes » California Pizza Kitchen Pumpkin Cheesecake – this is a perfect cheesecake for the fall holidays, their cheesecake recipe isn’t a secret anymore. You can make this copycat recipe anytime, that’s good since this recipe is seasonal and it isn’t on their menu all year long. Cheesecakes might be for the more adventurous cook, but don’t let that stop you. One important tip when making cheesecake is to bring all of your ingredients to room temperature before you start. This s a perfect cheesecake for the fall holidays, their cheesecake recipe isn’t a secret anymore. To Make the Crust: Put the graham cracker crumbs in a food processor fitted with the steel blade and process until they have a uniformly fine texture. Add the sugar and pulse to combine. With the machine running, pour the melted butter through the feed tube and continue processing just until the mixture forms a soft mass. Remove from the processor and firmly press the mixture into the base of a 9-inch springform pan, spreading it evenly. In the bowl of an electric mixer fitted with the flat beater attachment, beat the cream cheese until soft, stopping the mixer occasionally to scrape down the sides and bottom of the bowl with a rubber spatula. Add the brown sugar and continue beating until thoroughly incorporated and creamy. In a separate small bowl, stir together the flour, cinnamon, cardamom, cloves, ginger, and nutmeg. Add the flour mixture to the cream cheese mixture and beat until thoroughly combined, stopping occasionally to scrape down the bowl. In the same way, beat in the sour cream and then, one at a time, the eggs, scraping down the bowl after each addition. Add the vanilla and pumpkin and beat until thoroughly combined. Pour the filling into the prepared springform pan and place on the center rack of the oven. Bake for 1 hour, test for doneness by gently moving the pan to see if the center of the cheesecake has firmed up - a sign of doneness - or is still slightly fluid (alternatively, check the cheesecake's internal temperature with an instant-read thermometer, which should register 180 degrees). The cheesecake may require up to 20 minutes more baking time. When it is done, let it cool to room temperature and then refrigerate it overnight before removing the side of the pan. Cut the cheesecake into wedges with a sharp knife. What is “all-purpose flour plus”? I love CPK pumpkin cheesecake, bit this may get close to theirs but wont be the same. 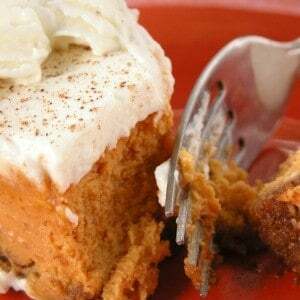 Anyone who has had it will know that the crust isn’t just Graham cracker, it is a ginger Graham craker and the cheesecake itself is layered with a more pumpkiny top layer and a more gingery flavered bottom layer. You can see the difference in the colors of the layers. That is what makes it phenomenal! Not complete – what size pie crust? What is the white stuff on top of the cheesecake? whipped cream? Yes it is whipped cream.